Tip: Because the wiring in the ceiling wasn't directly over the table, the chandelier was centered using swag. When simplicity is key, consider something like the Cord Pendant by Brendan Ravenhill. Its triangular armature features three LED bulbs that generate 750 lumens each—all together that is brighter than a single 100 Watt Incandescent. In this home, by interior designer Lynn Kleonidas the fixture illuminates a minimalist dining room with custom wood furniture. This stylish dining room by Leslie Cotter Interiors combines neutral colors and bold wallpaper from Thibaut's Watermark Collection with a retro hourglass chandelier designed by Rejuvenation. 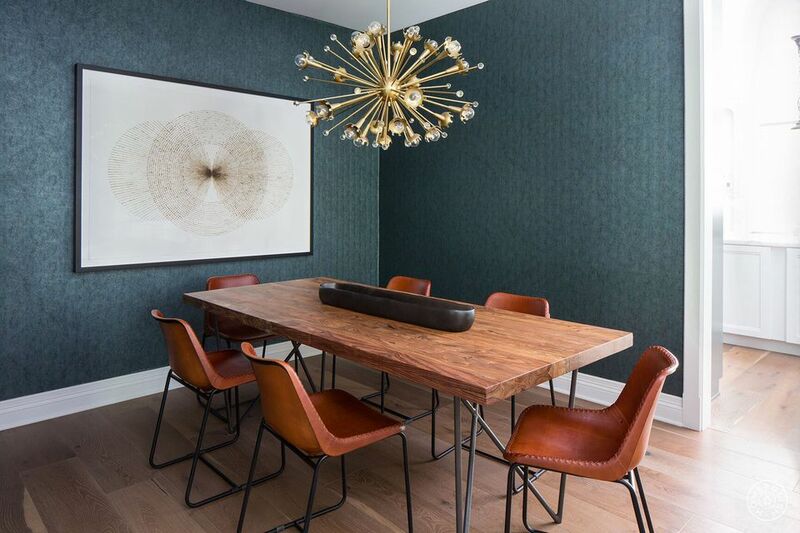 Understated elegance best describes the Norwell Linear Cage Pendant in polished nickel shown in this dining room decorated by Chango and Company. The fixture adds shine to the room's quiet palette.